World No. 1 and defending champion Rafael Nadal is on P1 as he gets ready for his R2 match. Rafael Nadal beat Vasek Pospisil 6-3, 6-4, 6-2 and reached the third round at the US Open. His only hiccup came in the second set, when he dropped his serve to fall 2-4 down. "The conditions are tough," Nadal said. "It was important to start very well with that break. To win in straight sets is always very positive, especially in these conditions. It's almost midnight, very happy about the victory." Despite a retirement, the fans in Flushing Meadows were treated to top tennis between fellow Spaniards, Rafael Nadal and David Ferrer. World No. 1 and defending champion Rafael Nadal is practicing in Ashe. Rafael Nadal and 2017 US Open finalist Kevin Anderson practice in Arthur Ashe ahead of their 2018 campaigns. With the impending duel ahead of us, we flash back over a decade ago to David Ferrer and Rafa Nadal's 4th round battle at the 2007 US Open! World #1 Rafael Nadal putting in the work today on the practice courts in Flushing Meadows. 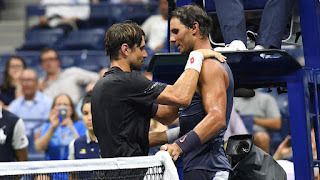 Rafa Nadal progressed to the second round of the U.S. Open on Monday after fellow Spaniard David Ferrer retired midway through the second set due to a calf injury. Nadal, the world number one, breezed through the first set without facing a break point but the 36-year-old Ferrer fought back in the second, breaking Nadal twice before the injury forced him to stop with the score at 6-3 3-4. 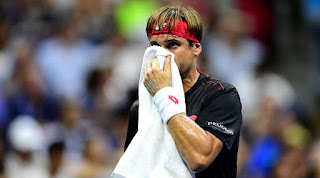 Ferrer, whose decision to retire brings the curtain down on his final appearance at a Grand Slam, said he had taken an injection before the match but was in obvious discomfort and need treatment courtside before he decided to quit. "I feel bad," he said in a courtside interview. "I had one shot in my calf and there was pain. I tried to play. I tried. "I'm so sorry because I can't finish the match, but anyway, thanks a lot." 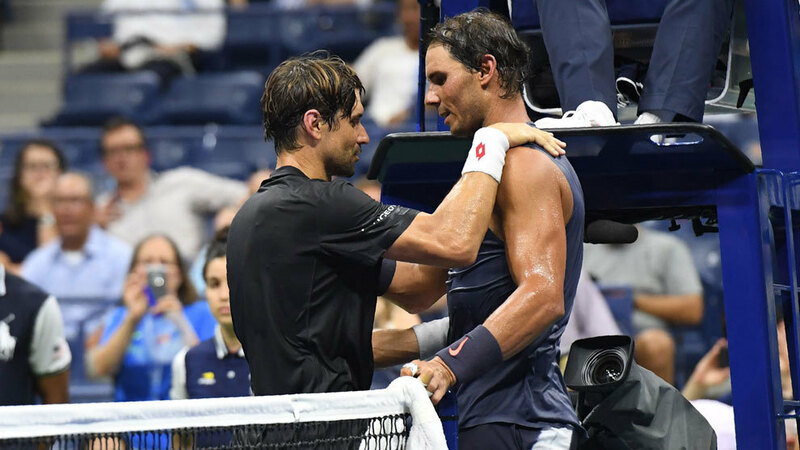 Nadal, who like his opponent was sweating profusely in the oppressively humid conditions, paid tribute to Ferrer, whom he beat in the 2013 French Open final. "I'm very sorry for him. He's one of my closest friends on the tour and we faced many amazing moments together," Nadal said. "It's sad for him to finish like this." 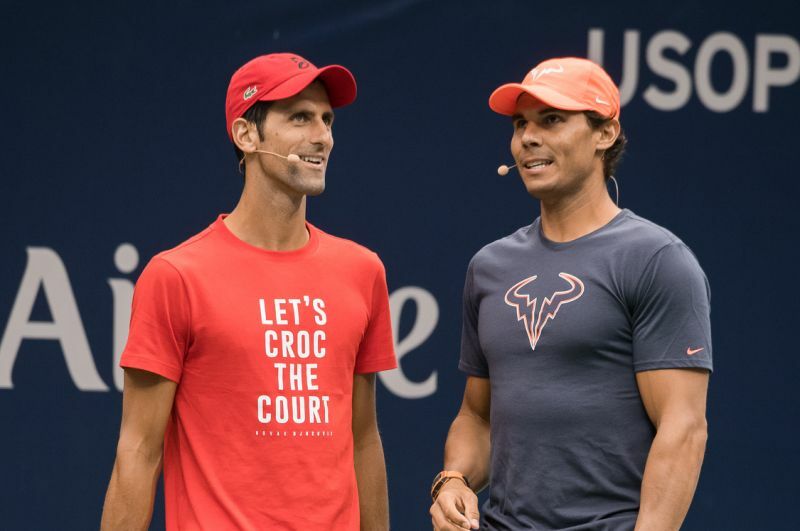 In an effort to accelerate pace of play, the U.S. Open introduced a shot clock — the first of its kind at a Grand Slam tennis event — and two former champions are on opposite sides of the net on the issue. The 25-second timer between shots begins when the official announces the score after each point. If a player does not serve before the clock strikes zero, he or she is issued a warning. A second violation results in the loss of a first serve. Whereas officials previously counted down in their heads and rarely enforced a time limit, actual clocks appear on the courts in New York City for attendees to follow. There was something bittersweet about David Ferrer's last Grand Slam match. Yes, he got to depart by sharing the court with his friend and Spanish Davis Cup teammate Rafael Nadal, under the lights on the big stage of Arthur Ashe Stadium at the U.S. Open. Rafael Nadal looks back on first rising to No. 1 in the ATP Rankings for the first time on 18 August 2008. Watch highlights of the Rogers Cup final, as Rafael Nadal secured his 33rd ATP World Tour Masters 1000 crown. Watch as Toronto champion Rafael Nadal discusses his straight-set victory over Stefanos Tsitsipas at the Rogers Cup. Rafael Nadal shows that even after 33 ATP World Tour Masters 1000 titles, success at this level doesn't get old. Rafa Nadal has withdrawn from the Cincinnati Masters as he adjusts his schedule to retain fitness ahead of his U.S. Open title defense. 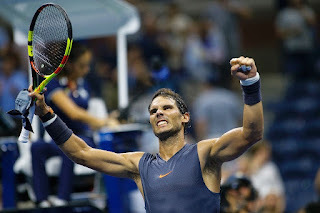 Rafa swept aside Stefanos Tsitsipas to claim his 80th career title with victory at the Rogers Cup in Toronto on Sunday. "I am very sorry to announce that I won't be playing in Cincinnati this year," Nadal wrote on Twitter late on Sunday. Watch highlights of Rafael Nadal's semi-final victory on Saturday at the Rogers Cup, as the Spaniard booked his spot in a fourth championship in Canada. Watch as Rafael Nadal reflects on his semi-final victory over Karen Khachanov at the Rogers Cup in Toronto. Watch Rafael Nadal curl a forehand passing shot for a winner down the line against Karen Khachanov in the 2018 Rogers Cup semi-finals.